1962 Chris Craft. Model -- 16 foot Ski Boat. This is a fine example of a classic boat. Starts right up and idles as smooth as can be. Visit https://www.youtube.com/watch?v=fZXhGv9PoGM See and hear it run. Conveniently located just off hwy 50 in Camino Ca. Boat and trailer are currently registered. Has a 283 185 HP V-8 made by Chevrolet I'm sure but it is branded with the Chris Craft name. 4 barrel carburetor. Single axle trailer that is powder coated and with spare tire. 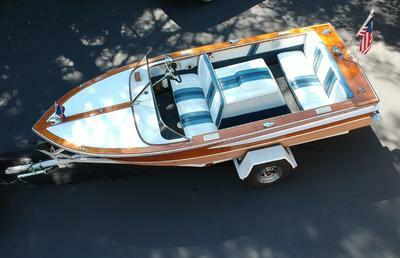 Boat was restored from the frame up in 1999 at a boat shop in the Bay Area. Have over $23,000 plus in receipts for restoration work and pictures of work at various stages of progress. All new upholstery and interior. Electrical system is 12 volt with rotary battery isolator switch. Pigtail installed for a battery charger. Have numerous large size (Approx 2' X 3') build drawings from the factory. All factory documentation and factory service manuals for all components. 2 new 12 volt batteries. Boat has been stored indoors with cover on in a climate controlled building for the last 9 years. Boat was completely serviced with all fluids changed before storage. Ladder, bumpers, docks lines - all new. The only part on the boat that is not factory stock are a pair of Bennett trim tabs that are electrically over hydraulic operated by the operator which greatly improve the ride and handling. They can be seen in the photos at the rear of the boat just below the water line. Take a look at the pictures and give a call to set an appointment to check out this one of a kind beauty.